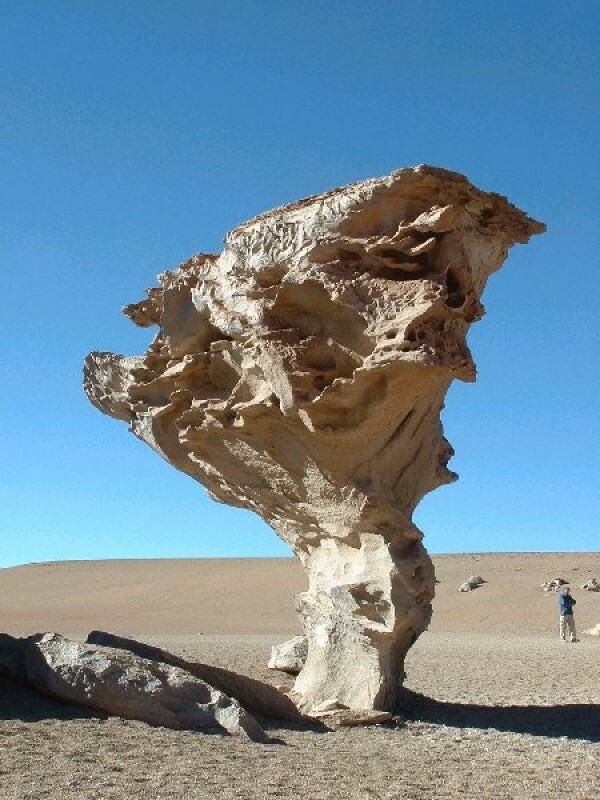 By Travis - Bolivia - 23 Jun/03 - Viewed 1670 times. After a day of rest (and laundry) in La Paz, we took a bus to Oruro and had enough time for a bite to eat before boarding a train for Uyuni, Bolivia. The train was very comfortable, and we really appreciated the lack of potholes and the other complications that are involved in South American bus travel. We arrived in Uyuni at 10:30 PM, and it was freezing cold. Thankfully a representative (13 years old) from To�ito Tours was waiting for us and hustled us quickly to the tour office and then to our hostel, where we slept using our sleeping bags in addition to the covers provided. We met our group for the four day trip of the Salar de Uyuni and southern Altiplano at ten the next morning: Bert and Janneke (a married couple in their 50s from Holland, in their last month of a year-long trip around the world), Henk (Bert’s younger brother who joined them in La Paz), Ethan (a 24 year old from Minneapolis who had spent the past nine months in northern Ecuador working with indigenous people on a sustainable agriculture project), along with our driver, Orlando, and the cook, Eli (a widowed mother of three). The group’s interaction would be the highlight of the trip for Abi and me—Janneke was so nice and motherly to us, Bert, Henk and Ethan kept us in stitches with their antics, and Eli is the Bolivian drama queen of the Altiplano. All eight of us traveled in a LandCruiser (looked about 15 years old, and rode like it), with our gear strapped on top. The first day of the tour we visited the Salar, a 12,000 square kilometer salt flat formed by an ancient lake. In the area of the Salar closest to Uyuni, the local people collect and process the salt. We saw a demonstration of how they dry the salt on top of a wood-burning oven approximately one meter by five meters, then add a little iodine, and grind it up and package it. The finished product sells for six Bolivianos (about $0.08 US) for 50 kg. Having the tourists come through every day and pay a Boliviano each for the demonstration is a major supplement to their income. They also sell ashtrays and figurines made out of salt, and every person who bought one made a joke about whether it was waterproof. It took several hours to drive across the Salar, where we could see for miles across the salt flat to the surrounding mountains. The cloudless sky made quite a contrast against the pure white plain. We stopped for lunch at an “island” of land rising up from the Salar covered by cacti, and hiked up to the summit for a 360� view. A little further on we stopped at a hotel where the building and furniture (including the beds) were made from salt blocks; kind of a hokey attraction, but unique. The first day of the tour, the food was quite good (chicken and pasta salad for lunch, roast chicken with french fries for dinner), but got more and more basic as the days progressed. The next couple of days we continued trucking across the Altiplano, visiting shallow lagoons populated with flamingos and other birds, volcanic rock formations (some of them in grotesque shapes carved by wind and sand), thermal baths and steam vents. Many areas were completely unvegetated, with other parts dotted with scrub brush and clumps of grass. It’s difficult to see how anything could manage to live here, but there were llamas and few other animals. The accommodations were pretty rustic, all six of us slept in a single room with bunk beds, but were glad for the cumulative body heat (on the second night it got down to –15 C). Each of the villages had electricity from about 6 PM to 8:30 PM, which enforced an early bedtime. The last 24 hours of the trip was the least scenic, but the most eventful. The excitement started on the last night when Abi went to take a shower. The hot water was heated by a rickety butane-powered heater, mounted on the wall inside the bathroom—it was pretty temperamental and the lady who worked at the hostel had to continuously adjust the gas as it would run very hot then go ice cold. A couple minutes after Abi turned the water off, I heard a commotion in the bathroom and thought Abi was calling for me. Long story short, Abi had passed out and went into a seizure on the shower floor, caused by a combination of exhaust and unburned butane from the heater, the very hot and very cold water, and the altitude. We moved her from the bathroom and put her in bed, and she regained consciousness after about five minutes. With the aid of several blankets, two sleeping bags, a stocking hat, coffee and three hot water bottles, she finally warmed up and eventually got a good nights rest (felt fine the next morning, other than embarrassment for being hauled from the shower half-dressed in front of everyone). The next day we had car trouble (carburetor and fuel line problems), causing us to return to Uyuni three hours late even though we skipped all of the sight-seeing stops for the day except one. Our group made the best of it though, placing bets on how long the truck would run before breaking down, how long the “pit stop” would take, and what time we’d get to Uyuni (Janneke graciously donated her winnings to buy everyone coffee that night after a marvelous dinner at Minuteman Pizza). We took the night train from Uyuni to Tupiza that evening, arriving at 4:00 AM. Tupiza is a small town in the far south of Bolivia, still on the Altiplano, but 1000 meters lower than Uyuni and corresponding warmer (thankfully). The tourist trap for Tupiza is that it’s the area where Butch Cassidy and the Sundance Kid spent their final days, but that didn’t interest us. It is a beautiful area, surrounded by multicolored mountains, canyons, and unbelievable rock formations. The first day here (after catching up on sleep) we did a day hike up a couple of the nearby canyons. We also took in the Corn Festival, where half of those in attendance were drunk on chicha, an alcoholic beverage made from corn. I bought a package of llama jerky, pretty tasty. Yesterday we took a five hour horseback ride through another amazing area south of the city. At one point my horse stopped, not wanting to descend a steep part of the trail—I tried to dismount, but did not stick the landing. My foot was stuck in one of the stirrups, causing me to tumble off, but thankfully Apache only dragged me for a couple feet before my foot freed from the stirrup. Our guide had to run after the horse for a quarter mile, as Apache returned to the last stop we made along the trail. Today we tried to buy train tickets to make it back to La Paz by tomorrow. The office only sells tickets the day of the trip, and had sold all tickets within two hours after opening (this was a first for us, and didn’t know we should have been there at 8:00 when it opened). So, we get to take an overnight bus instead…back to roughing it. The next three or four days will be travel and organization, as we prepare to meet Abi’s parents and youngest brother in Cusco, Peru.